I had just finished watching a flick at the Alamo Drafthouse Ritz on 6th St. in downtown Austin one Tuesday evening. Being a weeknight, the street wasn't as crowded as it typically is on Friday or Saturday. The street is closed during peak party times to allow the inebriated masses to wander freely without fear of being hit by cars. Since Tuesday is a fairly quiet night on "dirty 6th" the street was open to traffic. 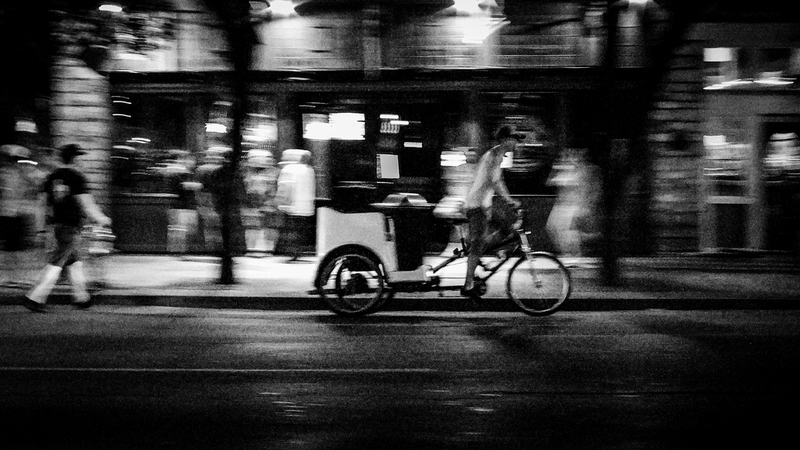 Bikes and pedicabs are popular in the congested downtown area these days. You also see a good number of motorcycles on warm nights. I saw a few small cab-like carts that I have never noticed before. Having my pocketable Fujifilm XF1 with me, I lingered outside the theater a little while and snapped a few images of folks riding by. I love the energy and motion in these shots. While that compact camera isn't the greatest in low light it worked fine for these panned captures. When you're dragging the shutter like this almost any camera with manual control can work. You can shoot at a lower ISO with the longer shutter to keep noise down a bit. I personally don't mind graininess and sometimes add more grain in post. I also don't fret too much over getting a pan shot's subject in perfect focus. The abstract feel of some of the blurrier shots often appeals to me. It's more about mood, gesture, and texture than critical focus.